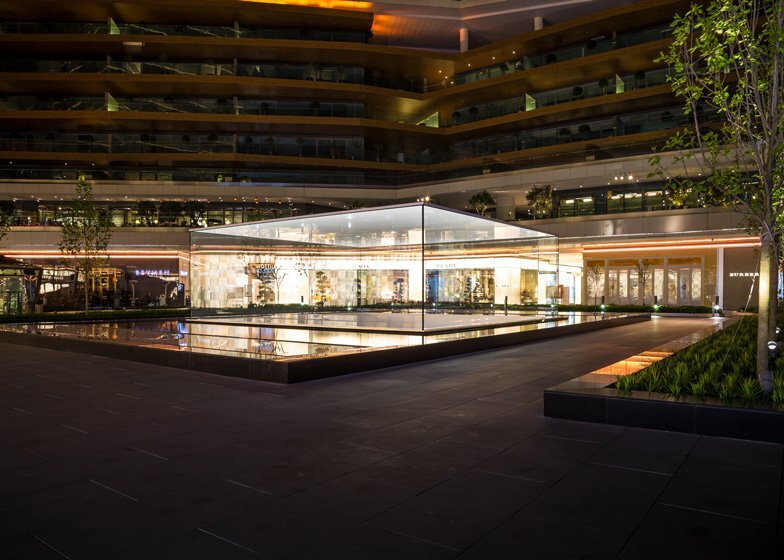 News: Foster + Partners has completed its first Apple Store at a shopping centre in Istanbul, Turkey. Located at Istanbul's Zorlu Centre, the Turkey store is the first in a series of retail spaces that British architecture firm Foster + Partners is creating for Apple and will be followed by another in San Francisco. The two-storey underground store sits beneath the main plaza of the shopping centre, inside an 18-square-metre void originally intended as a descending water feature. A frameless glass box rises above the void, announcing the presence of the store and offering shoppers a view down inside. Norman Foster's firm reportedly took over the design of all Apple stores last year and submitted designs for the San Francisco store in December. The move followed Apple's successful bid to trademark the "distinctive design & layout" of its retail spaces, including all-glass storefronts and rectangular tables. There are now more than 400 Apple Stores worldwide. However the computing brand came under fire in October when one of the original store concept designers said that its retail presence was "not evolving as fast as it could be". Foster + Partners first started working with Apple in 2009 on the design of Apple Campus 2 – the company's new California headquarters – after late Apple CEO Steve Jobs called Norman Foster out of the blue with the words "Hi Norman, I need some help". Main image is by Robert S Donovan. Additional photography is courtesy of Apple.